The readings on Palm Sunday invite us to participate in the drama of Jesus’ life – and of his disciples. 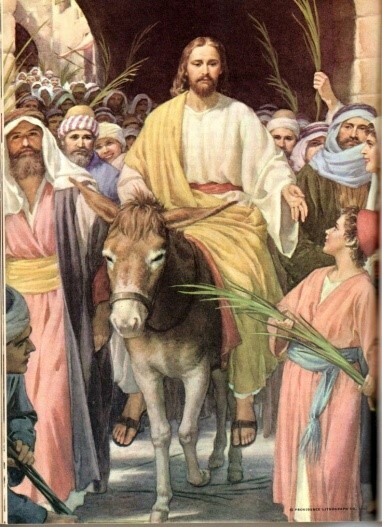 We join the people in Jerusalem and see ourselves cry out: “Hosanna! Blessed is he who comes in the name of the Lord!” and a few moments later: “Crucify him!” We are placed into Jesus’ passion as we enter Holy Week. We go step by step through the last moments of Jesus’ earthly life during the Triduum, on Holy Thursday, Good Friday and Holy Saturday. Mark's narrative shows us a very human Jesus, who begs God to let the cup pass him and asks his friends to be with him in this moment of anxiety. But the disciples fall asleep and God remains silent. Jesus’ life ends with the desperate cry “My God, my God, why have you forsaken me?” (MK 15:34) and (Ps 22:2). After reading and reflecting on these passages. It became clearer to me about Christ’s passion; it is not only His suffering and its meaning, but it is about TRUST and LOVE. Life in a family can be challenging sometimes. Loving “until the end,” like Jesus did can mean many things: I like thinking Jesus is on my side especially in these moments of larger and smaller struggles, in moments of tiredness, failure, limited patience, anxiety and so forth. It never fails. When I have other things to do, I have to stop and listen to someone who wants to talk, putting away things silently and repeatedly, even if it is not my responsibility, not to react angrily and offend someone, but say things in a loving, “constructive” way, forgive and to accept the forgiveness of others. There have been many things in my daily life that permit me to get in touch with Jesus’ passion and his suffering on the cross. I don’t have to wait for the “big things.” I’m sure that some of these small obstacles can keep me away from my call to holiness and healing.